Is a unique three day festival to be held in the beautiful town of Bellingen NSW to raise awareness & funding to support “George” & his friends. George is our festival mascot & he is the face of the local Bellinger River snapping turtle (Myuchelys georgesi) a species recently classified as critically endangered & who urgently needs assistance. 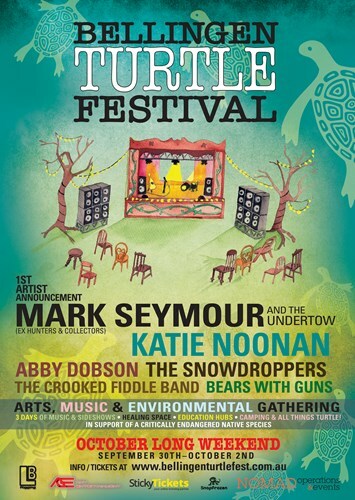 As such Turtlefestival was hatched…proudly presented by Nomad Events Turtlefest has gathered some of Australia’s leading contemporary artists, performers, scientists & Eco activists for a three day festival of music, arts, education & celebration. 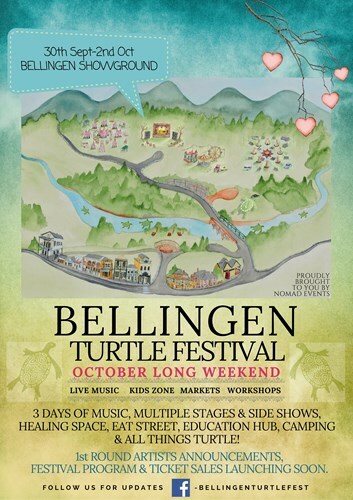 Turtlefest is an eco conscious, family friendly festival, coinciding with the school holidays & October Long weekend with serviced camping available on site in the picturesque festival Showgrounds….just a short two minute walk to the unique & eclectic town of Bellingen. Be sure to take some time out from festival activities to pop into ………………meet a local. Turtlefestival promises to have something for the whole family : workshops, a healing space, artisan markets, eat street, side show alley, Hatchlings kids zone, education hub, VIP guest speakers & much more. Gather, celebrate all things Turtley & help create awareness & funds to support this worthy social enterprise. *Children aged 0-12yrs & Companion Card Holders receive free festival entry :please reserve any free tickets when purchasing Adult tickets.